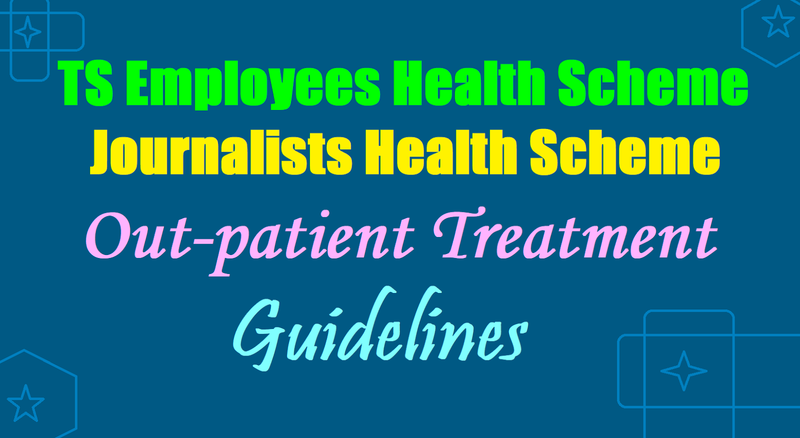 TS EHS & Journalists Health Scheme Out-patient Treatment Guidelines, TS Employees Health Scheme and JHS Out-patient Treatment Guidelines, TS EHS and JHS OP Treatment guidelines. G.O.Ms.No. 98 Dated: 07 06-2017:: GOVERNMENT OF TELANGANA:: HEALTH, MEDICAL AND FAMILY WELFARE (A1) DEPARTMENT:: Health, Medical and Family Welfare – Employees Health Scheme & Journalists Health Scheme – Providing Cashless and qualitative treatment to the State Government Employees, Pensioners, Working & Retired Journalists and their dependent family members - Guidelines for Out-patient Treatment - Orders - Issued. dt.15-03- 2005 amended in G.O.Ms.No.105, HM&FW(K1) Dept. 4. G.O.Ms.No. 174, HM & FW (M2) Department, dt.01.11.2013. 15. Govt.Lr.No.9851/A1/2016, Dt: 27-09-2016 of HM&FW(A1)Dept. 16. Minutes of the Committee held on 22-10-2016.
the existing medical reimbursement system under APIMA Rules, 1972, with additional benefits such as post–operative care and treatment of chronic diseases which do not require hospitalisation and treatment in empanelled hospitals. 3. 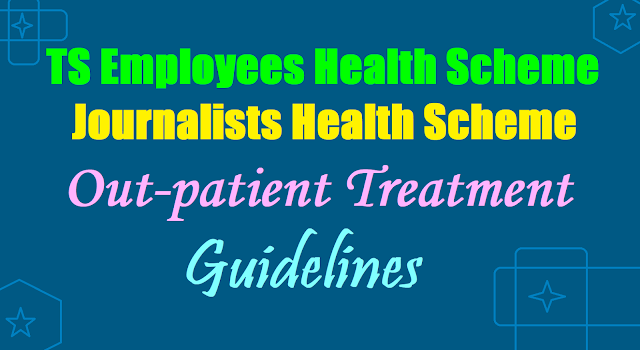 Further in the reference 13th read above, the Government have decided to provide comprehensive health coverage to the working and retired Journalists in Telangana State similar to the Employees Health Scheme while issuing guidelines for implementation of ‘Working and retired Journalists Scheme’ by Aarogysri Health Care Trust. 2) Chief Executive Officer, Employees/Journalists Health Scheme. 5. The AHCT Executive Board have reviewed the implementation of the Employees Health Scheme and Journalist Health Scheme on 22-10-2016 and felt that a Committee shall be formed to review on the packages (Medical, Surgical) and providing outpatient treatment. Accordingly the AHCT Board have constituted the Committee with the following members. respect of NABH Super Specialty Hospitals. 7. In a meeting held on 04-11-2016 by Hon’ble Minister for Health, Medical and Family Welfare and Chief Secretary to Government, it has been decided to provide O.P. treatment through Wellness Centres and also considered the long pending demands of NABH accredited Super Specialty Hospitals for revised surgical package prices and unbundling of medical management procedures as recommended by the Committee. 8. After careful examination, Government hereby issue the following orders for providing Out-patient (OP) treatment to the employees, pensioners and their dependents in supersession of orders issued in the references 8th and 9th read above. a) Out-patient treatment will be provided through Wellness Centres on common ailments and various specialties and also Indian medicine. b) Basic lab investigations will be done in the Wellness Centres and high end investigation will be referred. c) All the medicines / drugs, Surgical items, consumables, Supporting accessories will be provided as per prescriptions. d) Investigations which are not covered in the above categories will be referred to tie-up Diagnostic Centres (NABL) on cashless referral mechanism. a) To establish (14) Fourteen Wellness Centres for providing OP treatment, six (6) Wellness Centres in the Twin Cities i.e. Hyderabad and Secunderabad and eight (8) Wellness Centres in the erstwhile district headquarters of Telangana State for providing OP treatment. If accommodation not sufficient / not available in Government Hospitals, it is permitted to establish Wellness Centre in Rental Buildings. b) To engage required Staff on outsourcing basis with necessary skills and experience (Doctors/Specialty Doctors/Para Medical Staff / Data Entry Operators/House Keeping/Security, etc) to run Wellness Centres as per the strength shown in Annexure-I for each Wellness Centre. d) To procure Medicines/drugs, surgical items, consumables, kits, reagents, supporting accessories, etc. as per rate contract of TSMSIDC/CGHS/ESI/NIMS, or local empanelled chemists or by following other procuring methods mentioned under Financial Rules. e) To enter into agreement with private lab service providers on CGHS / NIMS/ESIC model for the investigation services not provided at Wellness Centres. f) To establish additional Wellness Centres with required staff as per the demand / requirement and load of the EHS & JHS patients with the approval of competent authority. g) All Wellness Centres shall be established in the similar pattern in respect of Specialties / Staff / Equipment, etc. 11. The budget provision for Rs. 34.02 Crores for Establishment of Wellness Centres, Rs. 91.00 Crores for Medicines/Durgs, Rs. 45.20 Crores for Out- patient investigations shall be made exclusively for Wellness Centres. 12. These orders will come into force with effect from 17.12.2016. 13. This order issued with the concurrence of Finance (EBS.V) Department vide their U.O. Note No. 6246/215/A2/EBS.V/2017, Dt: 06/06/2017.